Wednesday, May 3, 2017 was a special day in Westchester County, full of activities, information and entertainment for its senior citizens.In addition it was Republican legislator Rob Astorino’s birthday. It was a special and emotional day not only for Mr. Astorino, but also for our own quartet member and music educator, Dr. Stash Rossi. Turns out Stash was Rob Astorino’s music teacher. Judging by the warm hugs and reminiscing, Stash had a profound influence on him. Maybe not politically, mind you, but in the appreciation of music and some of life’s lessons. 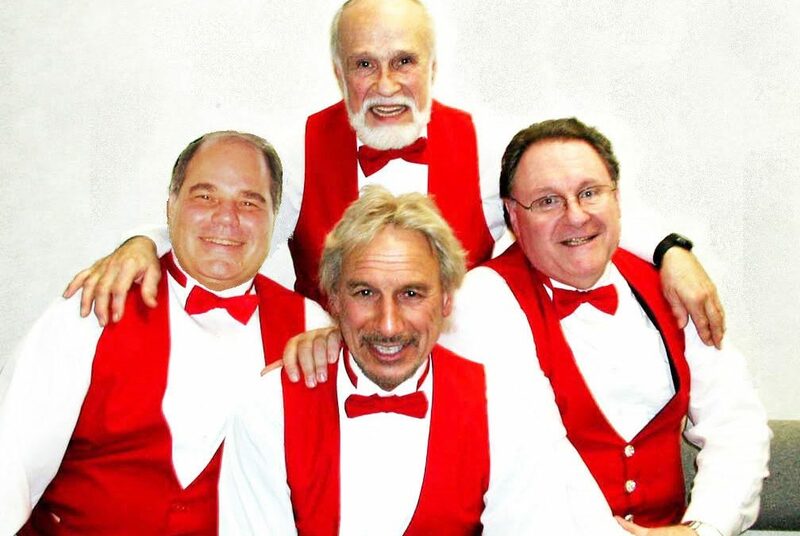 Freshmen Again (Bill Kruse first tenor, Len Sklerov second tenor, Stash Rossi baritone, and Marty Taylor bass) as well as various booths with information related to Westchester senior issues. Rob Astorino remembered Stash fondly, the two hugged and chatted about Rob’s memories of his High School days with Stash. It was a proud, non partisan time for all involved. In preparation for this event Freshmen Again had several rehearsals at Stash’s house. I always feel this is a win, win day for the quartet.Not only is Stash a gracious host, providing elaborate breakfast for us but I reflect, as I am driving home, that I just had a private singing and music theory lesson. Freshmen Again is so fortunate to have our maestro arranging for and guiding the quartet.It goes without saying that politics are never discussed over breakfast, for who knows one’s political persuasion. After singing America the Beautiful to a capacity filled hall, when the applause subsided we performed several of our numbers geared toward the seniors. We were then asked to sing for forty five minutes in a separate room while another group took the stage. As luck would have it, right from the get go our musical accompaniment broke down. Initially, we were stymied and upset, but being Westchester Chordsmen, we smoothly switched to our barbershop, a cappella numbers. I was rather proud that we were so versatile being able to fill the entire time slot with our chorus favorites. In summing it all up we, as Chordsmen are a versatile group. With good musical ears, and Keith’s and Stash’s guidance, we are an adaptable group and can put on a good show no matter the circumstances. So—it’s great to be a barbershopper, a Freshmen Again, and especially one of the Westchester Chordsmen! P.S. Rob Astorino delivered his remarks with what I perceived was a warm emotional smile—and for that day friendship and music prevailed, superseding the political divide in our nation. Bomb!! I sang with them for quite a while, and everything the writer (Len?) said about Stash is 100% on the money. If you haven’t already, you need to hear and enjoy a performance of theirs.